Their first assignment was simple: Get to know each other. Brianna Murray, a GCU freshman education major from Chicago, and Ashley Reynolds, a Phoenix sophomore who also wants to be a teacher, sailed right through. On Monday, minutes after meeting each other for the first time, Murray and Reynolds rapid-fire bantered about their common traits, as if they were characters on a sitcom who had grown up together. GCU student tutors met Monday at the Learning Lounge, where they will assist students from nearby Alhambra High School with their classwork. University staffers Arlin Guadian (back row, left) and Dr. Joe Veres (back row, right) will provide oversight. The next task for these two tutors — among 30 selected to work in Grand Canyon University’s new program, the Learning Lounge — will be more challenging. They’ve been trained to raise the confidence, math and reading skills, and college prospects of underperforming students at Alhambra High School during free, after-school study sessions at the lounge. Dr. Joe Veres, director of K-12 outreach for GCU, said the importance of Monday’s meet-and-greet for the tutors shouldn’t be underestimated. The relationships built among the GCU students will provide an important foundation, he said. 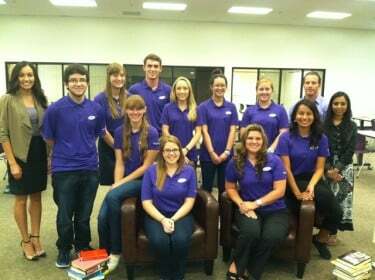 The Learning Lounge is the centerpiece of the K-12 Outreach Program, which developed after discussions between Brian Mueller, GCU’s president and CEO, and Kent Scribner, superintendent of the Phoenix Union High School District. The program is part of GCU’s continuing mission to help its neighbors — the people and businesses of its west Phoenix neighborhood — thrive and prosper. Alhambra High, less than a half-mile west of GCU’s main campus, is home to 2,800 ninth- through 12th-graders and 160 teachers. The school has a large refugee population, said Principal Claudio Coria, and more than 40 languages are spoken by its students, who come from all parts of the world, from Afghanistan and Burma to Somalia and Vietnam. When Coria became principal in 2011, Alhambra was rated a “D” school by the Arizona Department of Education based on its students’ poor showing on the Arizona Instrument to Measure Standards (AIMS). In 2011, only 51 percent of Alhambra students passed the reading portion of the AIMS. However, thanks to several initiatives Coria has implemented over the past two years to improve student learning and staff development, Alhambra brought its grade up to a “C” this year. Students’ AIMS scores in reading rose 11 points, to 62 percent, in just two years. 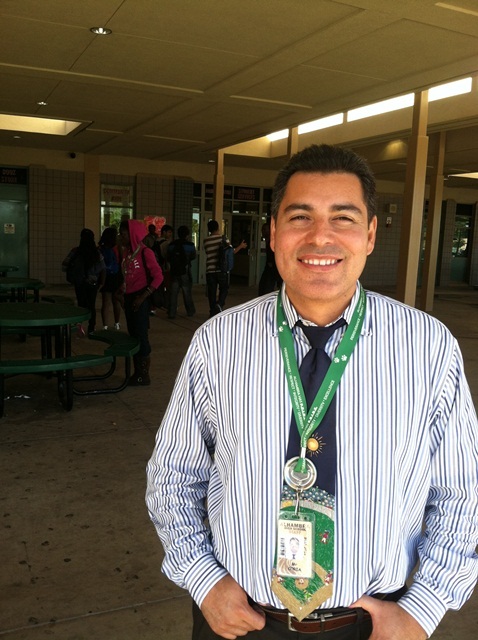 Coria, Veres and GCU believe Alhambra is on its way to “A” school status. Claudio Coria, Alhambra High School’s principal, has high hopes for his school’s partnership with GCU. The University “understood our immediate problem” in reading and math, he said. The Learning Lounge is open primarily to Alhambra freshmen who, beginning this week, can receive one-on-one tutoring from 3 to 8 p.m. each weekday. The high school has identified 500 freshmen as prime candidates for tutoring, but Veres said that no student will be denied help. In addition to 12 private tutoring offices, there are a computer lounge, more than a dozen couches and overstuffed chairs on which to cozy up with a good book or borrow an iPad from the lounge, four work stations, and plenty of healthful snacks and refreshments. In her 20 years of teaching, Debbi Paiz, one of four Alhambra teachers who trained the tutors on the district’s curriculum, said she never has seen a program like this. And it couldn’t come at a better time, Paiz said, because her students can’t succeed in the world if they are reading at a fifth-grade level. GCU had no shortage of students wanting to become tutors at the lounge. Senior Heather Shamburg, who plans to become a youth minister, views education as a primary need that GCU has a duty to provide to Alhambra’s students. Denelle Esmay, a junior from Lake Havasu City who is majoring in elementary and special education, said the tutors’ first job isn’t teaching the high school students to solve for x or to understand “A Tale of Two Cities.” That will come a little later, she said. “Our main job is encouraging them to get through high school and being a support for them,” Esmay said. Another goal of the Learning Lounge is to get high school students thinking about going to college and feeling more comfortable around college students and their environment. A new academic building, currently under construction on GCU’s campus, will become the lounge’s new home early in 2014. Already, they’re getting the message. Alhambra’s Class of 2013 has 26 freshmen at GCU, the largest number among any Alhambra graduating class, and many of them arrived with significant merit scholarships. Additionally, 72 Alhambra students currently are earning dual-enrollment college credit by being enrolled in concurrent classes at their high school and on GCU’s campus. Coria would like to see that number take off.